Individuals have become inundated with public service announcements and statistics detailing the breadth and significance of America’s gun control problem. Hyperbolic language and political debate have saturated the discussion, leaving Americans weary and apathetic. Voters have become disillusioned with the democratic process and legislators’ ability to enact effective laws. The Escape Pod needed to tackle this issue in a meaningful and respective manner that took a new angle on an old argument in order to transform the conversation. Visitors can learn more about and donate to the Brady Center and its core advocacy efforts using an on-site, solar-powered iPad. Signs nearby ask the question, "Why does Chicago have so many gun deaths, when Illinois has some of the country's toughest gun control laws?" juxtaposed with the fact that neighboring Indiana has some of the laxest restrictions in the U.S. The campaign follows on the heels of other agency’s campaigns designed to provoke conversation and raise awareness of the issue; however, this campaign hopes to achieve that objective without capitalizing on or exploiting current tragedies. The Brady Center hoped to highlight the lack of federal gun regulation and conflicting state laws that it believes would better protect American citizens from future gun violence. The installation is designed to be mobile and intended to serve as a roving piece throughout the summer, as a response to research that gun violence spikes during the summer months. Buying a gun in America is as easy as renting a bike. Chicago fulfills the role of martyr for gun violence issues, with everyone from presidents to popular culture stars synonymizing the city with weaponized violence. This association remains firm in consumers’ minds, despite the city’s recent decline in gun violence and attempts to reinvent itself. The cultural ethos surrounding the city provides the groundwork for the installation, facilitating the conversation. Relevance — The Chicago installation appeared in the midst of another series of school shootings across the county. Its placement was not intended as a response to any one specific event; however, its timeliness ensured its role in the conversation and guaranteed the intended effect, as numerous news outlets shared the project as commentary and fodder for their reports. While idea development and physical creation required several months, The Escape Pod hypothesized that implementation would remain relevant in the months to come. Tough issues demanding tough executions — Each element of the installation needed to mirror the intensity of the topic at hand in order to overcome viewers’ apathy. Strong, in-person visuals created the confrontational atmosphere necessary for the issue. 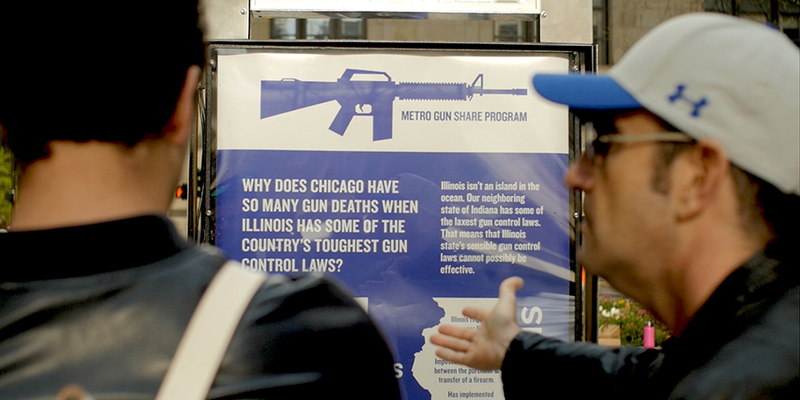 Chicago Gun Share Program utilizes several elements of a winning strategy: physical manifestations of abstract ideas in a big, bold way. These are tried and true implementations that we've deconstructed from other campaigns — view our other analysis to see these lessons in action.